The inspiration for these little gems came from our friend Richard Wasson of The Methow Valley Ciderhouse. Rub wells of donut maker with oil. Pre-Heat donut maker. Mix Dry ingredients together until well blended. Mix wet ingredients until blended. Blend dry and wet ingredients until thoroughly incorporated. Let mixture sit for 5 minutes (Emmer Flour absorbs moisture). Batter should not be runny but able to pour with help from a spoon). Add more milk if necessary to get it to this consistency. 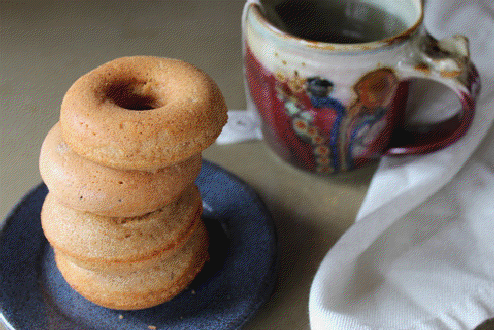 Fill wells of donut maker ½ full with batter. Put the lid down and bake for 6-8 minutes until donuts are evenly browned. Take donuts out and set aside to cool. Melt butter. Mix sugar and cinnamon. Dip donuts in melted butter face down and sprinkle with mixture. *These donuts are baked not fried. I know there are lots of folks who are not satisfied with only baked donuts. If you find yourself in this camp, you can bake them then fry them in your choice of oil!